Many road runners avoid running on trails out of fear that they won’t be able to execute their workout perfectly. However, much like mountain bike training adds a new dimension of strength, confidence and technique to your cycling arsenal, trail running can also beef up your normal road running routine. Road running happens mostly in the sagital (forward) plane of motion and road runners love the familiarity of roads and predictable surfaces since they can perform their workout perfectly. Trail running, by contrast, works several muscle groups and different planes of motion including frontal (side to side) and transverse (pivot) planes as you hop over rocks and run on uneven surfaces. Trail running offers a view with less traffic. It’s therapy for the body and the mind. There’s less pollution and cleaner air. Trail running strengthens many muscle groups, including smaller stabilizing muscles in your feet, glutes, ankles and calves. Trail running builds self-confidence and mental toughness. Maneuvering difficult terrain and nature’s obstacles require intense focus and patience. Sure, your pace may slow, but trail runners note that they can run more miles with fewer injuries because the lack of pounding on the road. Trail running offers a sense of adventure. You can literally go places you’ve never been. Trail running can also increase your road running power and speed with increased strength. 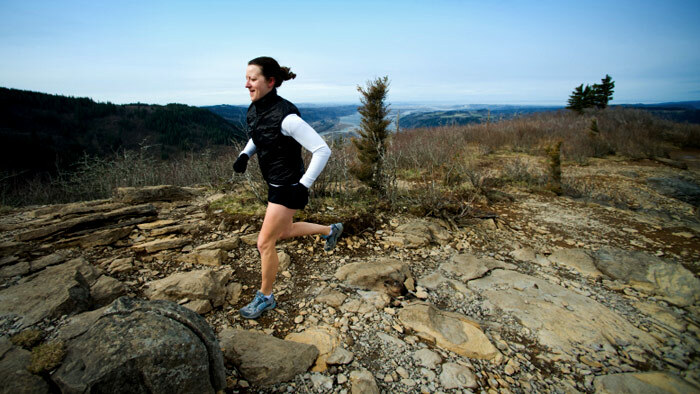 Trail running burns more calories while continually improving agility and balance. Getting faster on the trails isn’t simply about just about running faster. That can lead to a quick injury if you haven’t worked on agility and ankle strength. Fast trail running requires changing your gait and cadence in an instant and learning how to pick up your feet quickly in order to clear tree roots and other trail obstacles. If you practice on a trail, find a technical area and practice high knee drills and quick steps. If you are practicing on the road or track, consider using an agility ladder or running drills like grapevine, high knee drills and bounding. Both work on firing fast twitch muscles. Quick feet and a fast cadence are key to a strong run no matter what surface you’re on. Beginner trail runners may want to practice walking hills properly and running down them to strengthen glute muscles, foot coordination, and proper body positioning until you gain confidence and aerobic strength. In fact, in longer trail races, many athletes purposely choose to walk hills in order to conserve energy for the less technical spots on the course. As you become more confident, practice various types of hill repeats including fast sprints and long, slow uphill climbs at a lower heart rate. Both will make you a better road and trail runner. Much like road runners routinely build fartleks and speed intervals to their training, trail runners can also employ a similar training technique, just with a little more mental focus. Rather than worrying about a goal pace for the interval, focus instead on an effort level. Run just above your comfort zone for a limited time and then slow down or walk to recover. Instead of running for time, run to the next tree or the next hill climb. Train your body how to deal with the mental and physical fatigue of being on a trail, which increases at the end of a long run. These intervals are just as effective as the ones you do on the road. Regardless of terrain, know that a regular running regime gives your aerobic engine a great workout and a boost in your overall health and fitness. Be mindful of your surroundings, always wear proper identification, carry enough hydration and, most importantly, have fun!